Tough crowd in Vienna in late 19th century. 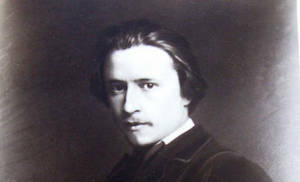 It’s a difficult road to travel as both critic and composer, which Wolf most certainly discovered during his own brief life (1860-1903), going to his grave with a legacy of incredibly varied songs yet never witnessing the performance of many of them. This three-disc set will allow music lovers to hear for themselves just how successful the critic-composer was in bringing long-lost Spanish and Italian poetry to life—via translation—into the far edgier language of German. For just over three hours, soprano Birgid Steinberger, mezzo-soprano Michaela Selinger, baritone Wolfgang Holzmair and pianists Russell Ryan along with Georg Beckman make a compelling case for Wolf’s place as a master of short forms morphing into cohesive wholes. From the opening tambourine (“Klinge, klinge, mein Pandero”—copyand-paste links to the titles and texts follows this review) to the song, dance and castanets of “Sagt, seid ilhr es, feiner Herr” (which has an infectious feel of the musical comedies awaiting their début in the 20th century), Steinberger captures the flavours of Wolf’s wide-ranging palette and understands when less is decidedly more (e.g., “whispering” in “In dem Schatten meiner Locken”). Holzmair’s convincing characterizations (notably mockery in “Triebe nur mit Lieben Spott”; angst in “Blindes Shauen, dunkle Leuchte”) along with searing declamation when needed (“Herz, verzage nicht geschwind”) keep the ear engaged. The core of this set ideally encapsulates suffering in silence (“Tief im Herzen trag’ ich Pein), a deadly search for peace (“Dereinst Gedanke mein”—with velvety undercurrents from Ryan) before the “man” seemingly rises from the grave only to find no takers as he tries to sell his heart. Lovers of all shapes and sizes will revel in this smorgasbord of relationships that never find their peace. The 10 songs which comprise the Sacred Songs of the Spanish Songbook differ in many ways from their secular colleagues. Most obvious is the inclusion of Selinger whose seemingly effortless control through intervals wide or large and ever-so discreet use of portamenti are ideally suited to the sighs, longing, pain and rapture of the texts. On two occasions, conversations with the Lord (especially “Wunden trägst du mein Geliebter”; “Herr, was träg der Boden hier,” which deftly bookend the set) add much to the religious fervour. Hugo’s own personal problems with life and faith find worthy expressions in these songs as the notions of “well-deserved punishment,” “save me [Lord],” “poison of sin,” along with the “sorrows of the earth” paint a decidedly bleak portrait for all concerned. The accompaniments are wonderfully skillful with the movement in “Nun wander, Maria” at one with Mary’s journey to Bethlehem and the extra depth for such moments being “weighed down” (“Führ mich, Kind nach Bethlehem”) which is superbly realized by Holzmair. An intriguing hint of Brahms (D-minor piano concerto)—intended or not—finds its way into the first interlude of “Ach, wie lang die Seele schlummert” with the greatest of reverent ease. Wolf also manages a brilliant melodic surprise on the very last word of this group: “dir”, leaving it to Ryan to deliver the hope of “flowers” rather than “thorns” for mere, sinning humans in a most benedictive manner in the final measure. The second group of 16 secular songs from the Spanish Songbook are much more intense, almost as if rehearsal was over and Wolf—through his three surrogates—was now ready to expand unabashedly about the challenges of human relationships. From hopeless grief (No. 1) to the notion of being wary of oaths sworn under the influence of love (No. 8), later the role of Mother in shaping her daughter’s mores (or lack thereof: No. 11), until finally (and oh so close to home for the composer, along with Wagner, whose broad sweep and fearless declamation make this the most thrilling song of the lot), a pair of lovers must meet under cover of darkness in order for their union not to “shock” the neighbours (No. 16). The songs compel the ear with every turn, twist and sigh. Steinberger delivers the finale with devil-may-care passion and power but is also heard to ideal effect thanks to her exquisite control in No.4: “dying of love” indeed. Holzmair’s wonderfully introspective sense of inner sorrow makes No. 13 especially memorable. Many of these songs feature a far more prominent role for Ryan’s contributions either introducing the moods, bidding—like the illicit lovers—reluctant adieus or expertly supporting, anticipating or directing—as needed—the well-matched singers. Wolf digs still deeper into the affairs of the heart with the 47 songs that comprise the Italian Songbook. The music is at once warmer, lighter (many moments of mockery add much-needed whimsy and zest between the darker ones) and gives the piano (now under the very capable care of Beckmann) a much more prominent role in setting the stage for the poetry or wordlessly summing up all that has come before. Holzmair is particularly effective in the only two songs (Nos. 24, 25) that break the method of the “boy-girl” order. He positively rings the top in the fanciful serenade “Ein Ständchen Euch zu bringen kam ich her” that offers up an incredibly heartfelt contrast as he wonders, “What song should be sung for you?” Beginning as a Mimi-like chant, “Wir haben Beide lange Zeit geschwiegen” is a marvel of personal angst and faith thanks to Selinger’s superb artistry.